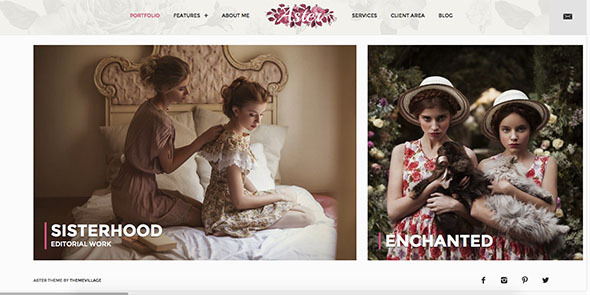 Today we have handpicked some creative themes related to photography which use WordPress cms. 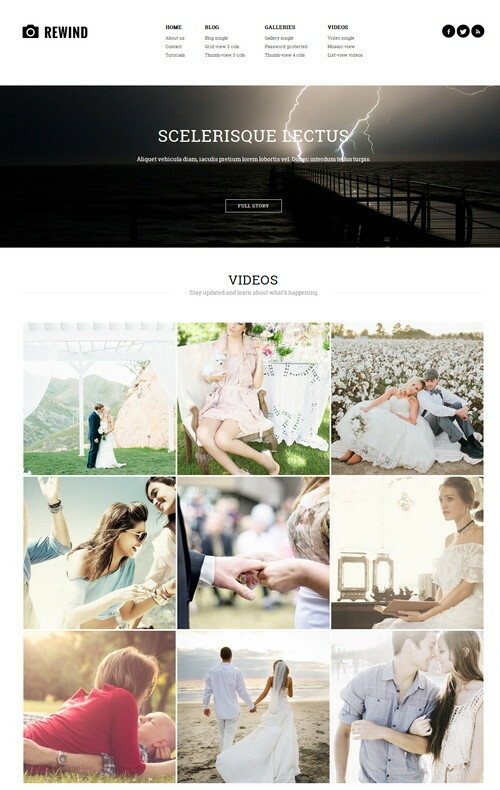 These are professional themes built for creative photographers and creative artists who are looking for gallery, full width slider based and grid themes. The main essence of the photography theme is to support grid based photographs, sliders and to be able to showcase a clean portfolio overall. Gallery can be integrated into the theme with no sweat as these themes and wordpress itself lets you do that easily while uploading images. 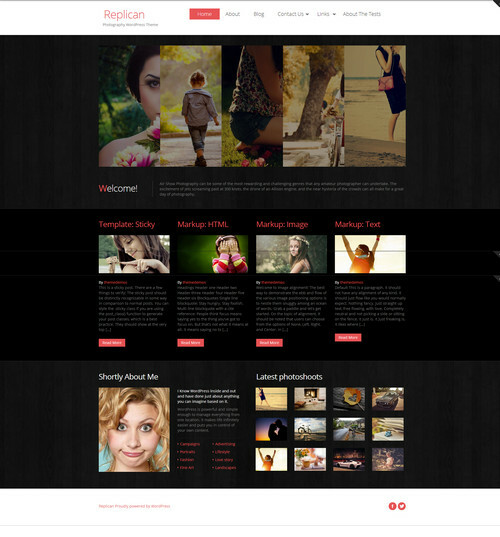 Fullscreen display of your photos are an added option provided by many of these photography WordPress themes. 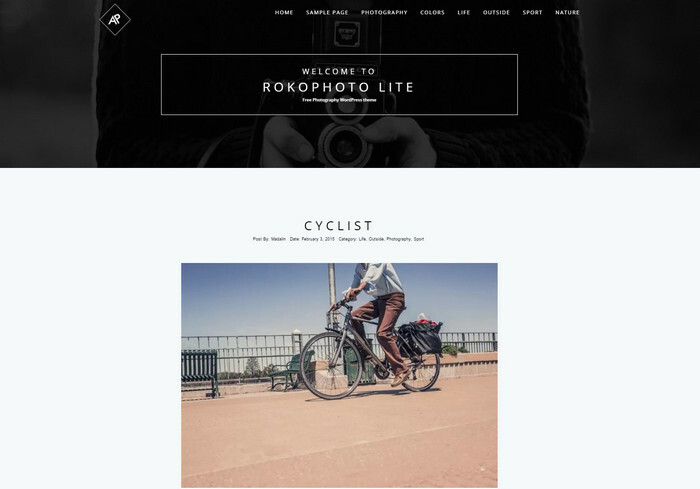 RokoPhoto is a minimalist and beautiful theme for photo-blogging and photography websites. It has a clean and classy design, with the content showing up gradually due to the lazy loading effect. 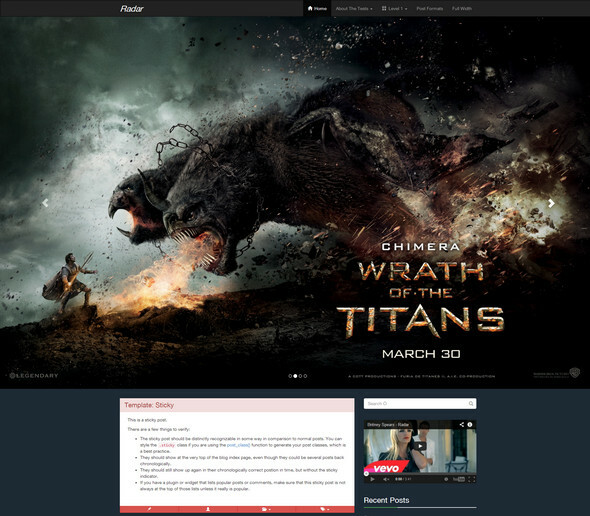 The theme has a full-width animated header and a blog layout, with the posts being placed one below another. You can upload your best images and also add descriptions for each. The theme is a good choice for a photography portfolio. RokoPhoto uses the elegant black-and-white color scheme and has a vintage-like appearance. It is responsive, translation and SEO ready, and highly customizable. It also provides custom logo, custom colors, a sub-header, footer copyright, widgets, and custom backgrounds. So feel free to customize it to your taste anytime. 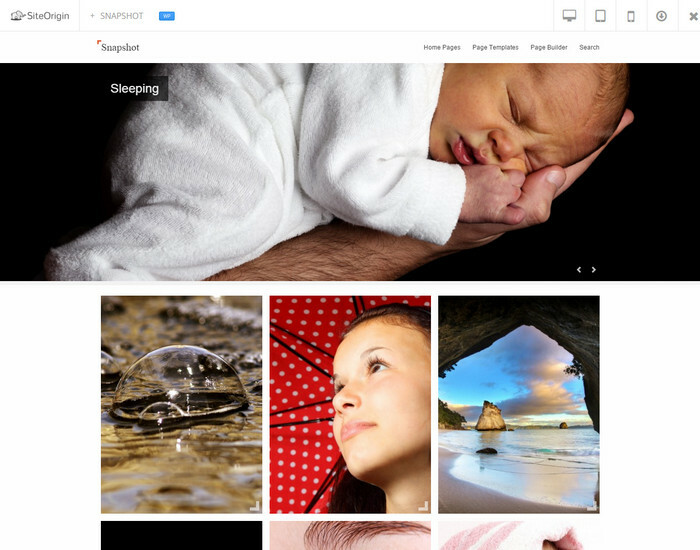 Snapshot is a clean and professionally wordpress photography theme built mainly for photography enthusiasts. It is great theme for those who would like to create grid style website with multiple galleries and also add password lock for images and galleries. Other features include custom background, powerful drag and drop page builder, full width slider, responsive layout etc. 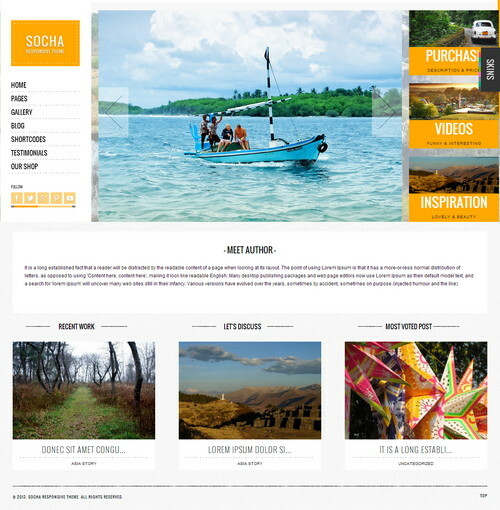 Harmonic theme offers travelers, photographers, magazine writers a highly customizable and very easy solution to build a custom website and blog solution. The theme is responsive and you can fully customize the appearance to your requirements with a powerful live customizer option developed by automatic. 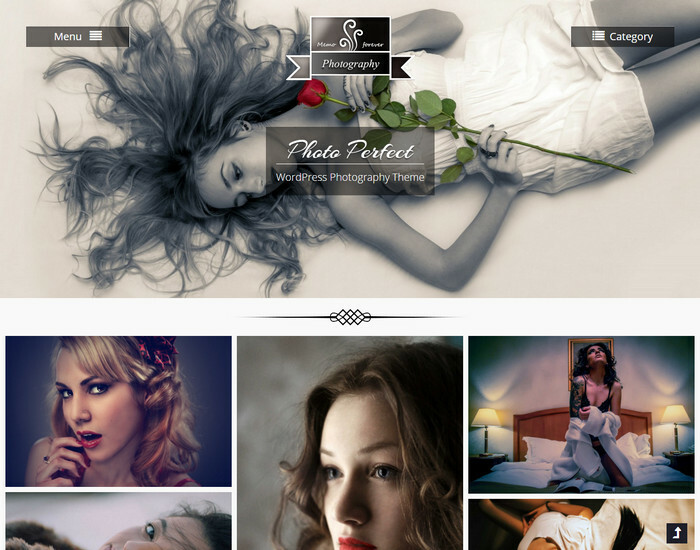 Photo perfect is one of the best WordPress photography theme we have seen lately designed for photographers, photo bloggers, creative peeps etc. Main features are responsive design, custom widgets, galleries, contact section etc. The impressive header image and site title on homepage can be assigned with Live Customize of WordPress. You can replicate the demo in a few seconds by setting a static page for front page display option. Overall a theme with powerful theme options which will give you full control of your website layouts and features. 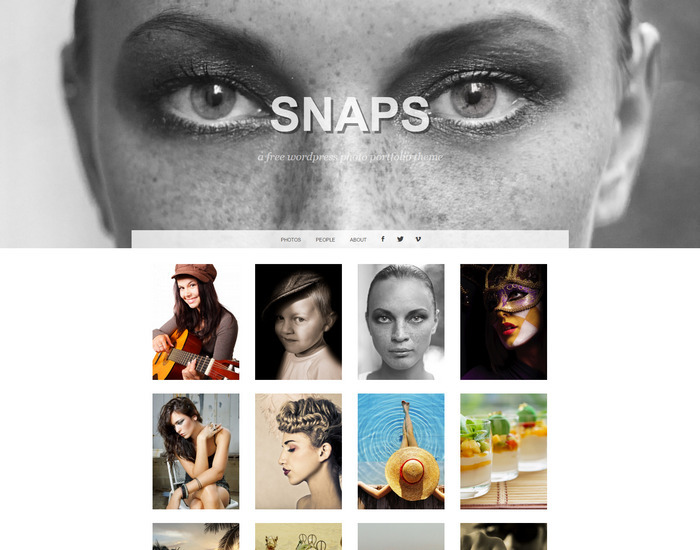 Snaps is a brilliant theme from graphicpress and it loads faster than most themes and has a professional look most suitable for creative artists, graphic designers, illustrators, photographers. Snaps has different features like automatic updation, theme options and page templates. While the interesting feature is the header image which is shown in all its glory on the homepage and the rest of your latest posts continue its path. 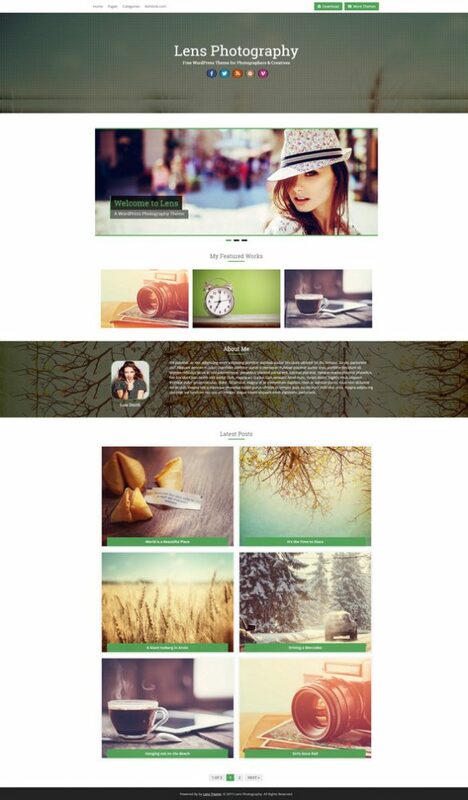 This is another brilliant theme made by the developers(automatic) at WordPress. The horizontal scrolling effect of your latest posts will hook your visitors eyes and they will also appreciate your website for having a minimal overall look. The featured image will clip to look good on your website and you don’t have to regenerate your old images but it will be better to add a horizontal image to look crispier. So thats it ? Nope. The mobile version is just too appealing, the posts will now stack vertically and it feels like using a mobile app. You will have the basic options to change header logo and title in Live customizer panel. Interesting options include adding a dark filter to your featured images as well showing a colored block if featured image is missing. Overall, Boardwalk is a great effort from inhouse developers of WordPress. Already featured in our personal blog collection of wordpress themes, this theme is unique and responsive for your daily updates. Radcliffe can work well for individual photographers who are in pursuit of a blog and with a fullwidth image showcase. The interior pages/posts are well designed with clean typography and your large photographs will appear much more appealing here. The homepage is a stack of your latest posts and a featured image is a must as they appear on your websites homepage. 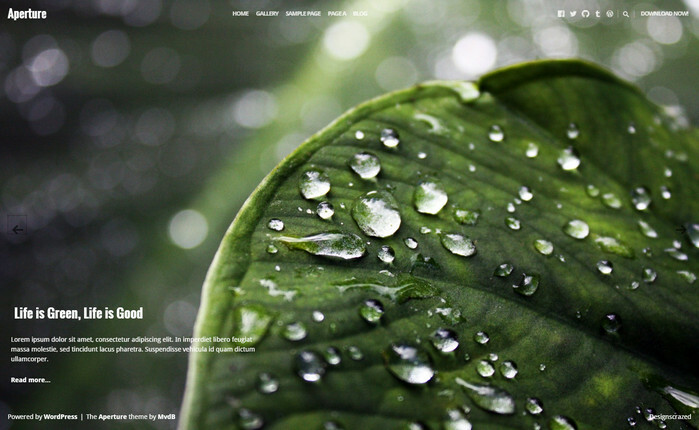 The theme has limited features as this is a simple blog theme for photographers and nothing much. WordPress Live customizer can be used to change logo, accent color and menus. Worth a try. A modern and simple wordpress theme for photographers who like to showcase their latest shots in a grid style blog. This theme is efficient for mobiles and tablet as it is responsive and looks good with its dark color background. The pre loader on single post looks good and the page readability is great with nice font size and weight. 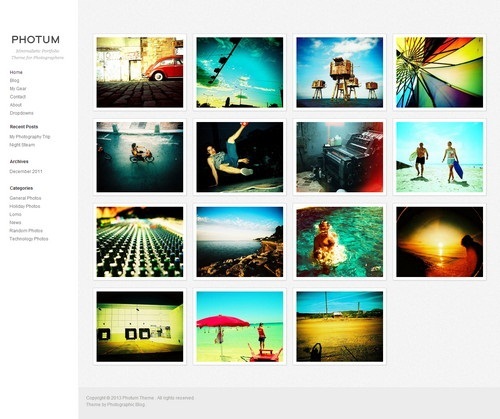 A beautiful theme with full width featured image and a cute gallery page which you can add easily. There is unfortunately no slider as the homepage shows only a featured image assigned to the page set as homepage. The whole theme is responsive and is most suited for photographers with blog posts along with a option panel for all basic needs. WooCommerce support is not official but the theme works with it and the only problem i think i saw is container width for products is full page which you must manually change. The theme is impressive even if it is a lite version of this pro theme. Aperture is a free theme with fullscreen slider and just that. 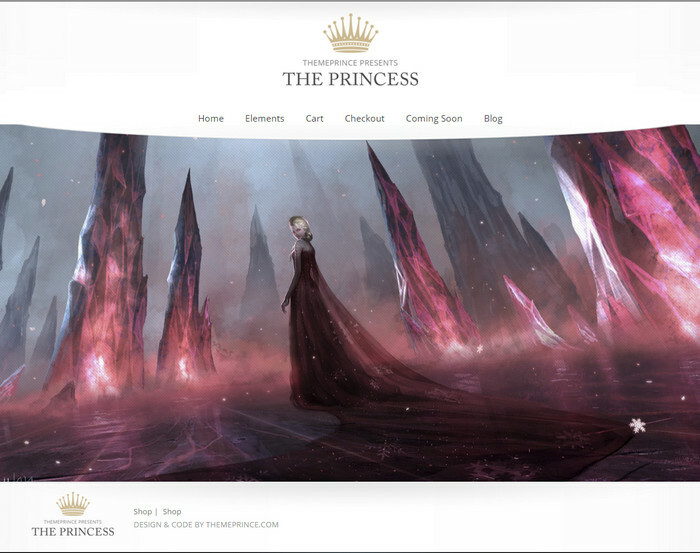 The theme offers responsive design and the pages can have a background image to match your theme style. Aperture can be used for basic purposes only and can be used to display a slider which has a limit of 5 posts. 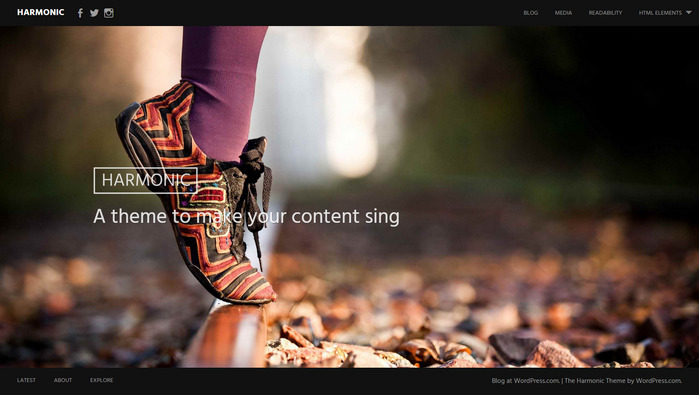 Theme requires jetpack plugin and WordPress account connected together as the plugin enables a option(Featured Content) in live customizer which must be used to display slider posts. Featured Content will let you add/create a tag which then must be assigned to your posts(maximum 5) with featured image. And last but not the least to get the slider working a static page must also be set with Fullscreen slider template from within the Page Attributes. This is a decent theme to showcase of set of images as gallery, large images etc just try and let me know how it feels. A bit of customization and it will look wonderful overall. 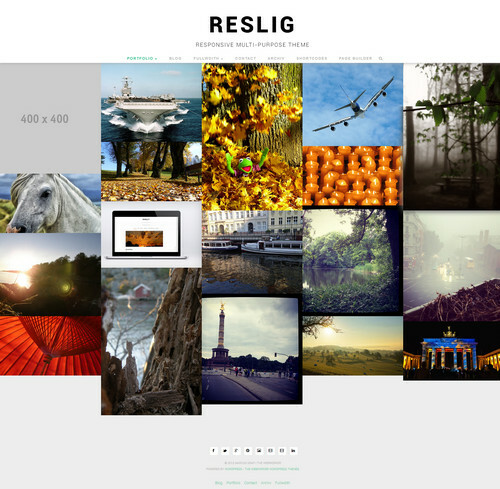 This responsive photo blog theme will let you express your artistic insight and creative writing with your shots. This theme incorporates an excellent typography with a simple blog layout and also options to change the homepage layout to boxed or full width size. You can set the background to fixed or stretched to the whole page if you like. Freedom is nothing short of amusing WordPress theme bringing a new life to your blog with fully functional theme settings. You get the option change the layouts of homepage, post, page and even category archives with the help of live customizer apart from the traditional sitewide boxed/fullwidth layout. Adding a header or a background image adds up to the immersive look of the website. The slider is a call to action section which gets the work done for you easily even though there is a limit of four slider elements in this theme. 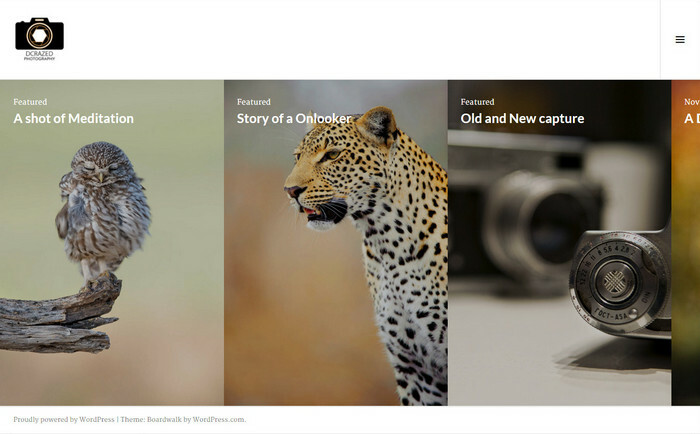 Overall a powerful free theme to have for a photographer interested in blogging. 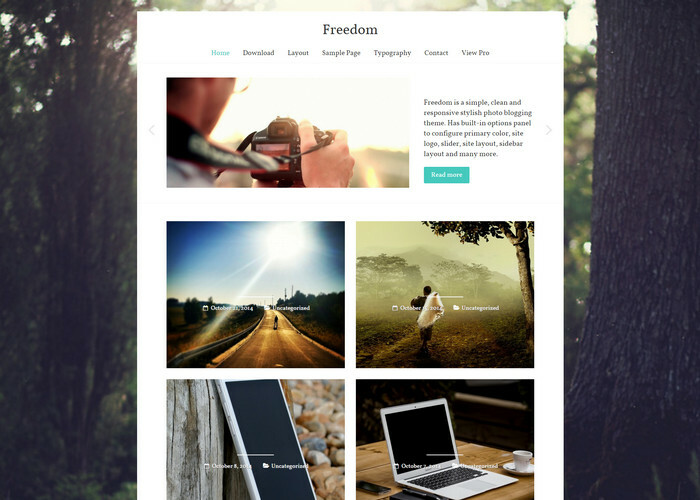 A beautiful free WordPress theme for photography enthusiasts with a simple interface for displaying photos. 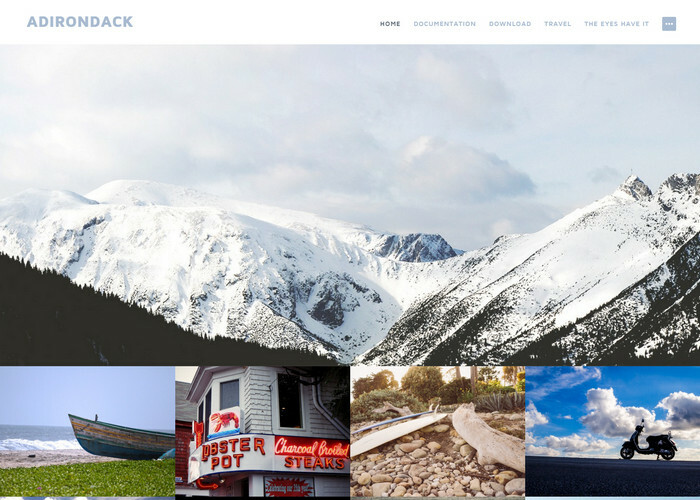 The theme uses jetpack plugin to showcase the full width featured image. You must install jetpack which lets you make a post featured( like a sticky post) so that the main image will show up on your website. I never liked jetpack and doing this annoying thing is time taking but a documentation is provided to get started. The looks are the best feature about this theme with a neat display of navigation menu system. Each page and post can be set with a large featured image just in case you are wondering. 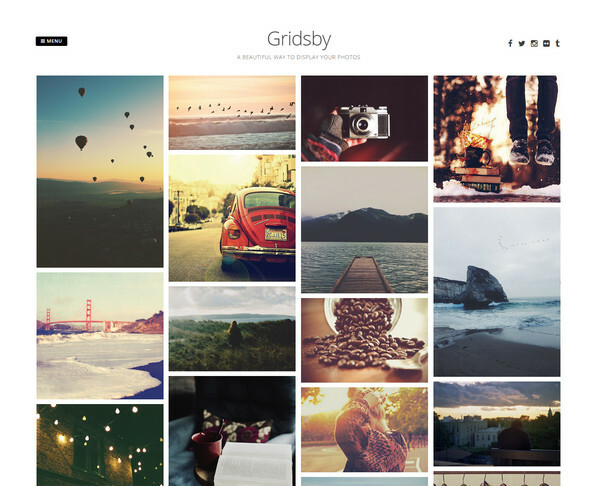 A simple and lite grid theme for photographers to display their portfolio of photos in style. 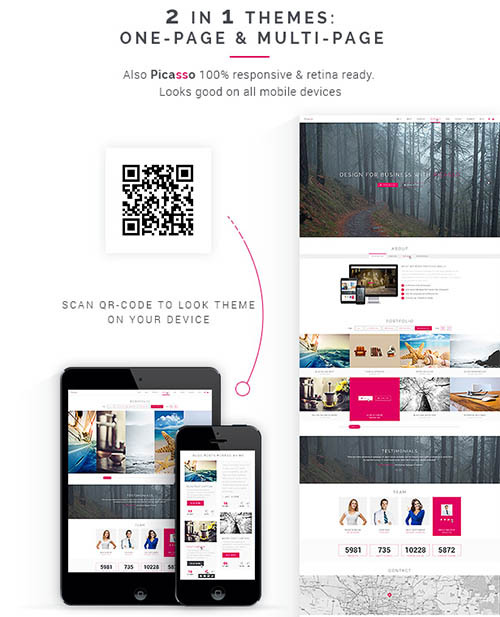 This is a responsive theme so you can access it across multiple devices. 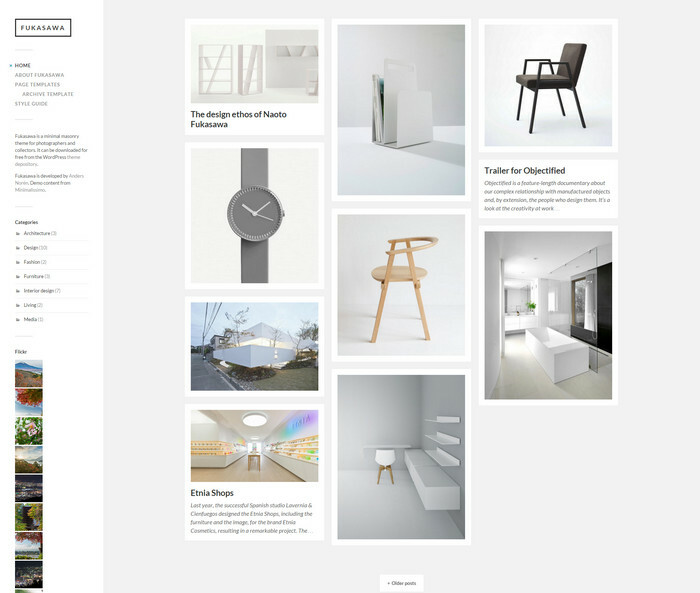 A grid theme with four column layout and responsive layout design. Use this perfect theme for your photography display and interaction with your fan base. A responsive creative theme for bloggers who like to add photography related articles on their new website. Featuring a homepage boxed slider and sections for showing featured works along with a unique blog layout will interest you that is for sure. A full screen wordpress theme suited for energetic display of live photos. 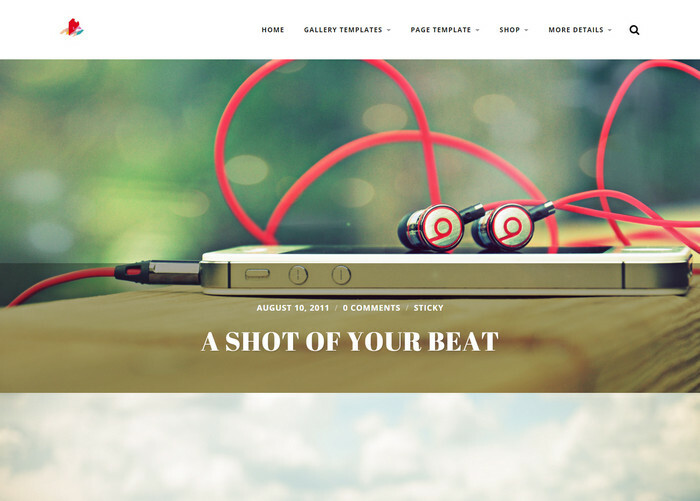 Get this lite theme for free to use on your new website. 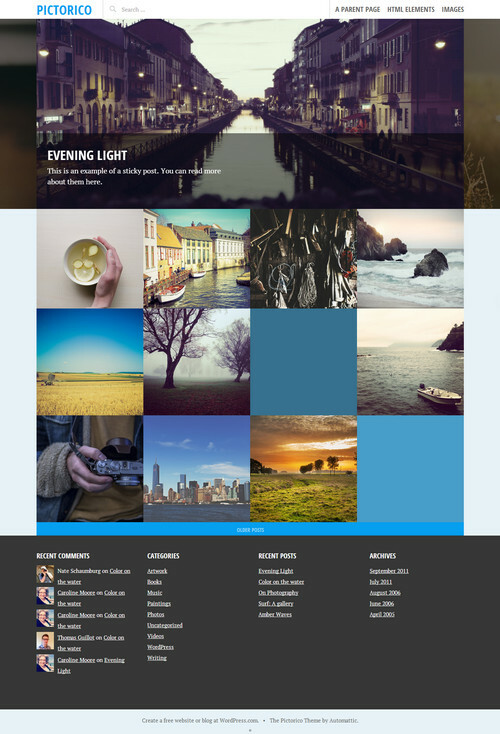 A beautiful free WordPress photography theme for any user who like to share their photos in grid view. Multiple columns for displaying images are very cool with ajax and the whole theme is scalable to any resolution as it is responsive as well. 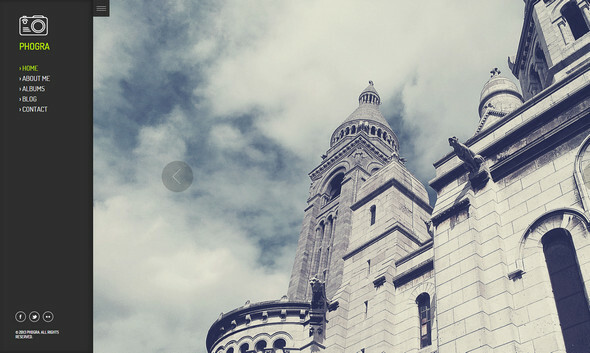 A free wordpress photography theme released recently for photography enthusiasts. The features include a unique slider, responsive design layout, minimal dark overall design etc. Another one of the best Photography WordPress Themes by team automatic is a single-column, grid-based portfolio theme with large featured images and a post slider, perfect for photoblogging or a portfolio site. 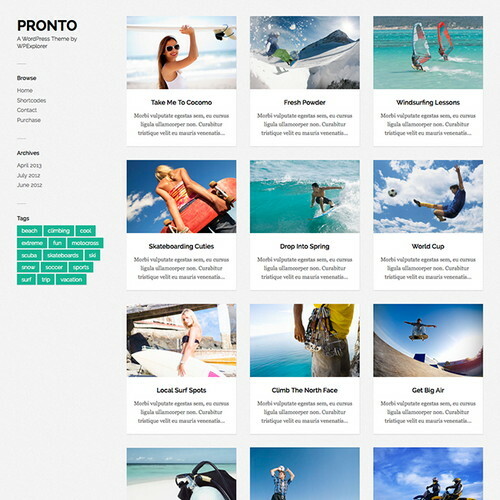 Pronto is a very clean and minimal jQuery Masonry WordPress theme that’s perfect for showcasing your posts in a grid like fashion, that will re-adjust depending on your visitors browser size. Everything is set to work right out of the box, simply install, add your posts and you are set. 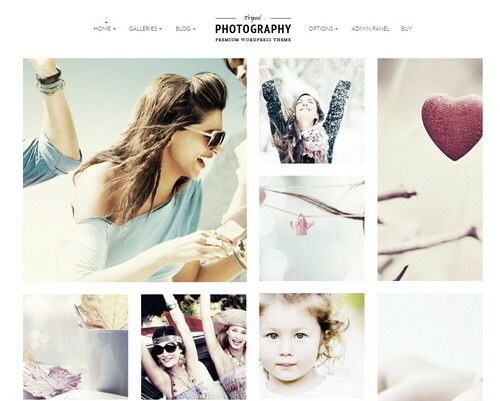 Photum is an HTML5 responsive theme for a Photographers portfolio. I released this theme yesterday on my Photography Blog. The portfolio is handled by custom post types and there are extra taxonomies for the location of the photo and equipment used which can be set by the user. A dark new theme for wordpress photography fans with a huge full width slider for image preview and also with blog layout for adding daily updates on your photo blog. A graphicpress release for photographers letting them showcase a fullscreen gallery of blog posts. Changing the website colors and font is possible through theme options. The website lets you add a slider category in theme options which when set will act as default category displayed on homepage. The maximum no of posts to be displayed by scrolling horizontally is limited to ten which can be set in theme options. The demo for this theme is useless and doesn’t showcase the slider features. To get that glorious look with top header with large images and the rest with smaller ones you might need atleast 30 posts assigned to a single category. Every post which must be displayed on the homepage must be assigned to one category to make the website setup complete, as the slider category which has been set will be the only category displayed on the website homepage. The theme is a bit old and lack responsive design but i think this is a decent one. If you are a bit of a designer then you can add custom css with media queries easily. Please do comment and share if you have done the media queries by yourself as it will be a great help as this theme is a bit unique to be free. Exclusive photography WordPress themes for photographers, studios who would like to showcase their extreme skills with modern websites, jaw dropping visuals and unique set of features to add extra functionality is here made available to you. 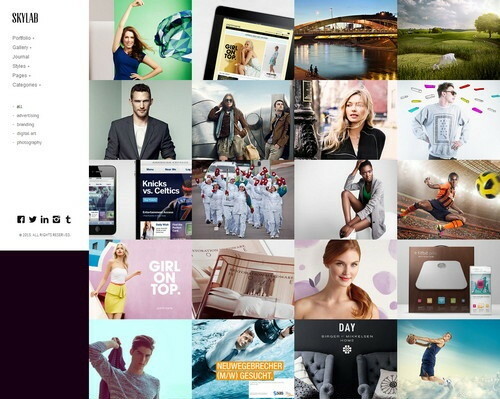 Aster is a premium theme for photographers with clean options to create a feature and visually rich portfolio pages. By including a portfolio product type you have the option to add new portfolio items which will in-turn showup in homepage. In each portfolio post you can add your photos and the photographer details. A featured client area will showcase albums of each clients and with options to lock the albums with password so that only the respective client can access them. Homepage returns all your albums for easy access in a horizontal slider. The theme is well built for multiple platform devices with responsive media queries and theme options to change the website style, color. 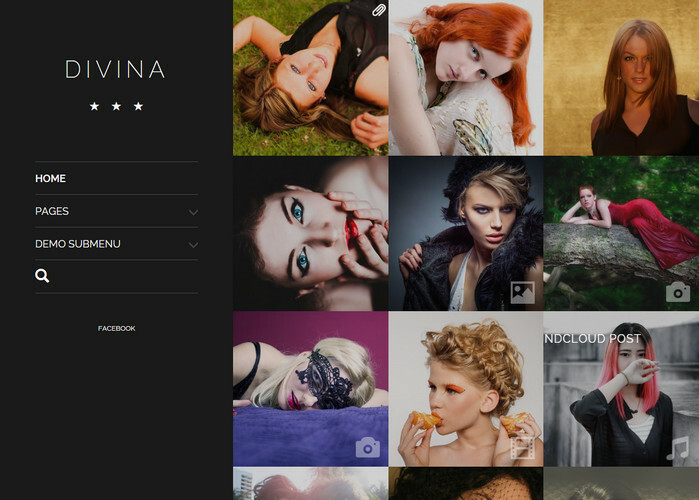 A premium photography wordpress theme which supports retina ready displays with responsive layout. A powerful theme panel to manage your skins along with the power of clean seo markup makes this theme completely build for high user interactivity. Kameron is a responsive theme which has everything you need as a photographer, 100s of shortcodes and features to speed up your file uploading, showcasing. A premium photography theme for wordpress users who want to add gallery of their pics, images on a WordPress website. With responsive and retina ready the fullscreen images can be viewed in crisp quality on any device. Also has multiple gallery options with 2 to four column gird, masonry and classic gallery options. This theme provides 5 amazing gallery layouts with fullscreen slideshows, grid , masonry carousel and more customization is possible with gallery options. Completely seo optimized for search engines with responsive design will make this photography theme suitable for all. 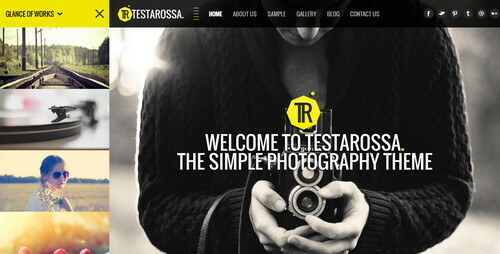 Testarossa is a simple photography wordpress theme suitable for photography portfolio websites. Rewind is a professionally developed WordPress theme for photographers with intuitive and super simple yet powerful backend options. ePix is a powerful multi-purpose / fullscreen photography WordPress theme, packed with a ton of features unique to ePix including the Fullscreen slider ( Awesome for showcasing your photography ), stunning galleries, advanced live Skin Editor, Page Builder, Parallax and so much more! Ideas is a Fullscreen Responsive Studio theme for WordPress with a variety of fullscreen posts ( Slideshow, Kenburns, Video and Photowall ) The theme is WPML ready and includes .po .mo language files. Social header area is specially designed for WPML widget & Social link widgets. 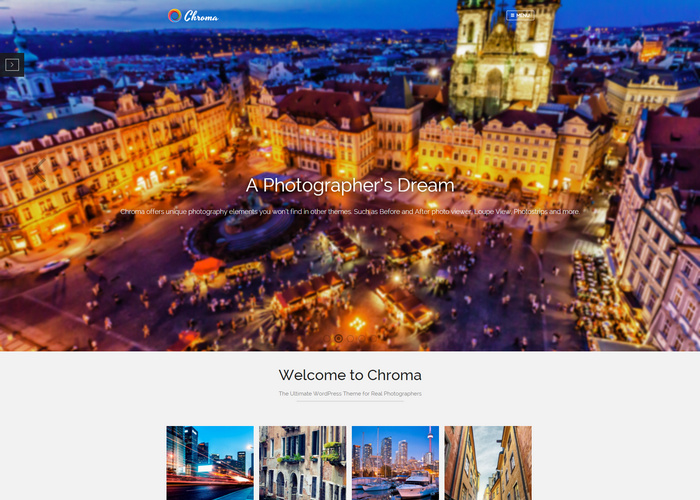 Chroma is a responsive, retina-ready, photography and multi-purpose WordPress theme. Chroma boasts an impressive set of unique features and powerful customizations options focused on showcasing your work in unique and endless ways. Fuerza is the best way to build a perfect photographic theme. Fuerza will become a great foundation for your next project! Font, background and color options as well as the dynamic template builder will help you create the Website you need in no time. Lumen is a very unique and creative photo blog theme. Its minimal design will make your work stand out. Choose one of the 12 backgrounds included with the theme or create your own and give your site just the look you are looking for. Exposed is a powerful Photography and Portfolio WordPress Theme which is best suited for photographers and creatives who use portfolios to showcase their work. Exposed come with our SmoothThemes Framework help you easily customize your theme without any coding. The theme suitable for photography and portfolio websites and will look great across all major browser platforms. Division is premium wordpress theme siutable for frelancer, creative agency, art directors, illustrators, photographers or bloggers. 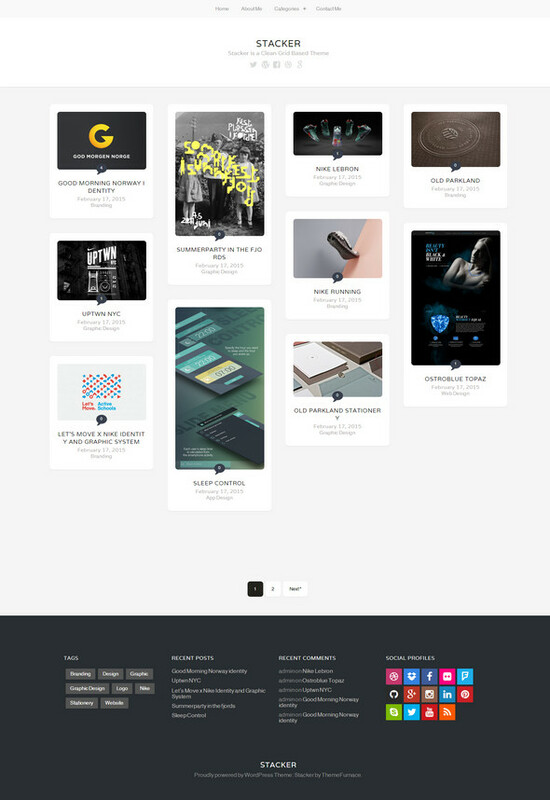 Skylab is a Premium Portfolio / Photography WordPress Theme with an innovative, touch navigation super smooth hardware accelerated slider designed for photographers, illustrators, graphic designers, art and creative directors, movie directors, architects, luxury businesses or bloggers. Socha is a photography theme, for people who likes to travel arownd the world and put all inspiration photos on personal WebSite. 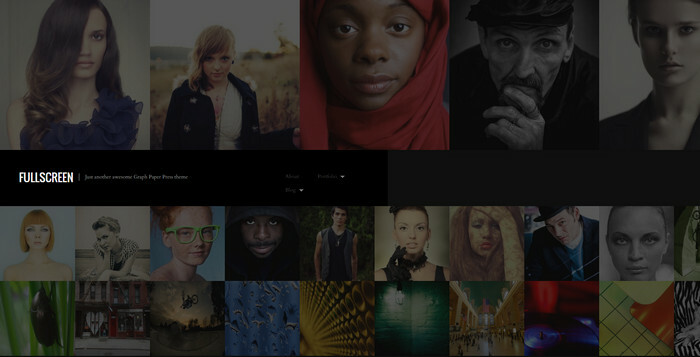 A dark beautiful and creative responsive photography wordpress theme designed by peerapong just for you. It is a perfect foundation for Creative / Portfolio / Personal site with Blog, Portfolio, Galleries, etc. If you want to impress your visitors with an awesome unique and fresh-looking site – this template is exactly right for you! I love the photo perfect theme. It’s really great to showcase you work without having to upload everything to the hybrid cloud. I really appreciate you guys sharing these themes with us. Thank you so much. Such a nice Photographs… In my marriage i take Pre-wedding Photoshoot from #dilanattas.. For all girls wedding is a big dream for all the girls… So its our priority to have someone who captures our precious moment.. However WordPress is not such a good option for photography website. Every new feature needs an appropriate plugin, and even a slight change in design needs you to get into coding. I’ve shifted to Pixpa instead and it has been a great decision for my photography business. A photographer should spend more time outside taking pictures rather than spending it on designing a basic portfolio website.